International Virtual Learning Academy lives up to its name – we are truly an international community with students living all over the world. Our international flavor is especially appealing to high school social studies teacher, Lynnsey McGarh. Between earning her Bachelor’s and Master’s degrees, Ms. McGarh spent two years with the Peace Corps in Quito, Ecuador. She loves to explore new places and cultures. I teach the World Cultures Club. In class, we have spent a good deal of time talking about what culture is and how it affects our everyday lives. We have also studied each region of the world. For each region, each student picks a country to research and then they present to the class a history of that country, a description of the government, language, religion, popular food, holiday traditions, music etc. The students seem to really enjoy it. One of the most memorable meetings/assignments was an “online scavenger hunt.” For example, the students had to find an example of a popular song in China or a popular dish in the Middle East. We had a lot of fun watching music videos and listening to music from other countries. I also had the students read a novel that addresses cultural diversity and differences and write a book report for the midterm and final exams. They were to not only summarize the book, but analyze the cultural struggle addressed in the novel. 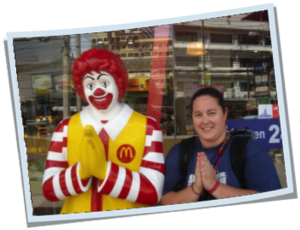 Photo: Stopping for lunch at McDonalds in Pattaya, Thailand. Clubs, meeting in a virtual classroom twice monthly, provide opportunities for students to work collaboratively. Students explore intriguing topics or new interests, engage in discussions, and complete projects. Students receive 0.5 elective credit for their participation. Visit our High School Clubs page to learn more!